There are so many ways that you can add that extra flavour to your Christmas ham. Here are a few you can try for the season. Preheat oven to 325Â°. Place ham into large baking dish and cover with foil. In a small saucepan over medium heat, cook pineapple juice 25 minutes, while stirring frequently. Juice should reduce by half. Add honey, sugar and mustard. Cook 5-8 minutes, while constantly stirring. Once glaze has thickened to a syrup consistency, remove from heat. Glaze ham 20 minutes before cooking is complete. Preheat oven to 325Â°. Score ham, and stud with the whole cloves. Place ham in foil lined pan. In a small pot on low, heat the corn syrup, honey and butter. Keep glaze warm while baking ham. Brush glaze over ham, and bake for 1 hour and 15 minutes in the preheated oven. 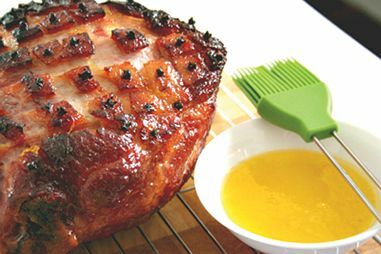 Baste ham every 10 to 15 minutes with the honey glaze. During the last 4 to 5 minutes of baking, turn on broiler to caramelize the glaze. Cut your ham in a diamond hatch pattern all over to allow the flavour to penetrate the fat layer. Combine ingredients and brush ham liberally; get it in all the cracks and crannies. Place in a baking pan with sides and cover tightly with foil. Bake at 325Â° for 2 hours, brushing often to let glaze caramelize.